Thor: If you knew where he was, why didn’t you call me? Doctor Strange: I have to tell you, he was adamant that he not be disturbed. Your father said he had chosen to remain in exile. And you don’t have a phone. 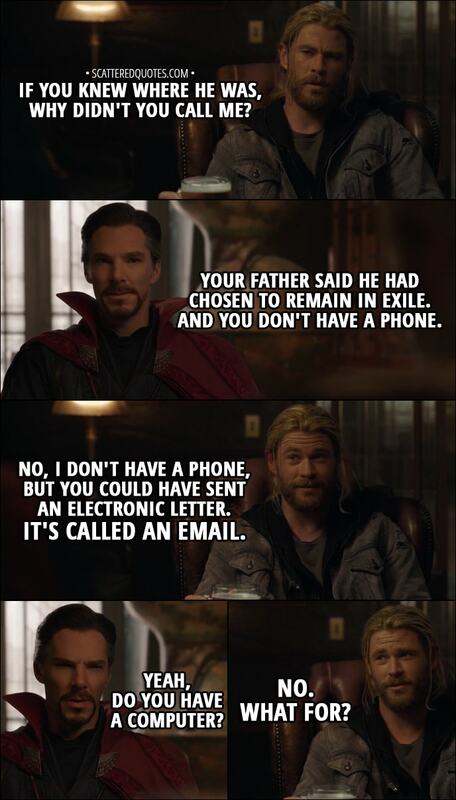 Thor: No, I don’t have a phone, but you could have sent an electronic letter. It’s called an email. Doctor Strange: Yeah, do you have a computer? 18.2.2018 Could have sent an electronic letter. It’s called an email.